Yes, I have been gone for awhile. Yes, I have missed you. (Have you missed me?) Yes, I am back. 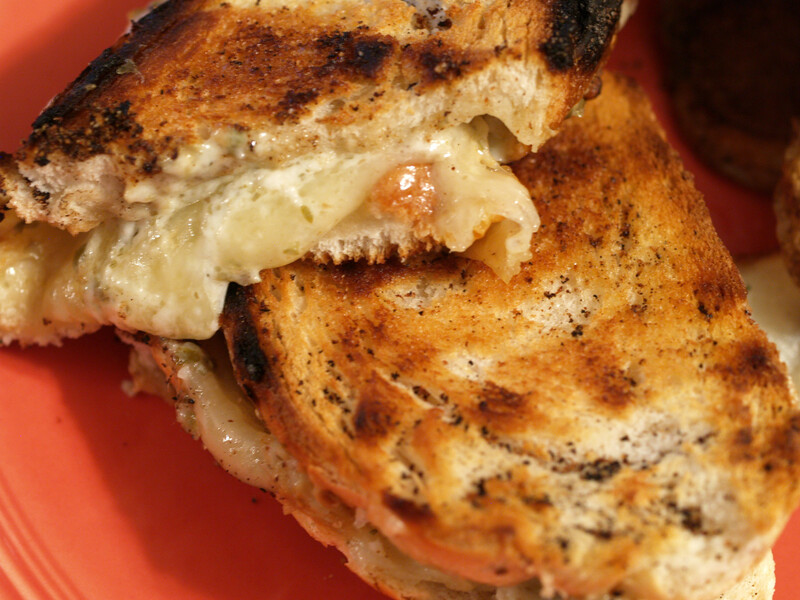 Yes, this grilled cheese was very yummy! I would go into where I have been (Jewish holidays, birthdays, etc. ), but I don’t want to bore you. 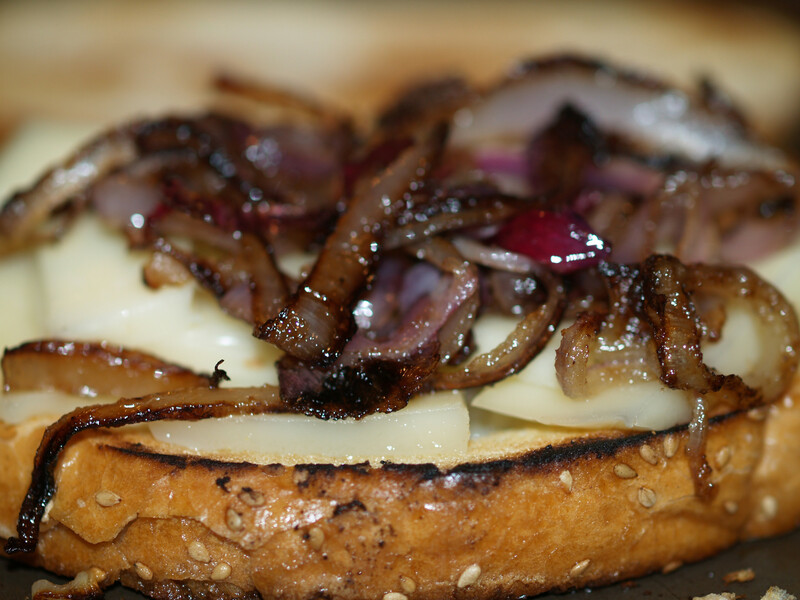 Plus, I don’t think anyone came here to read about my life story, you just want to know about this great grilled cheese, featuring “kicked up” Goat Cheese. Right? Right. I am a big fan of Goat Cheese so it was the first cheese I thought of when I wanted to add some of my peppers directly into the cheese. The lady at Whole Foods echoed my sentiments so I went home with one package of Whole Foods Organic Goat Cheese. Yes, it is perfect on its own, but tonight, I thought I would kick it up a notch. I added multiple types of peppers, lemon basil, and chives to a pan and then added in the cheese, cooking on low heat. Perfect. While stopping at Whole Foods last Sunday, I decided I was going to purchase all of my ingredients for the night’s grilled cheese right then and there. I had some ideas rolling around in my head (pun intended), but nothing concrete. 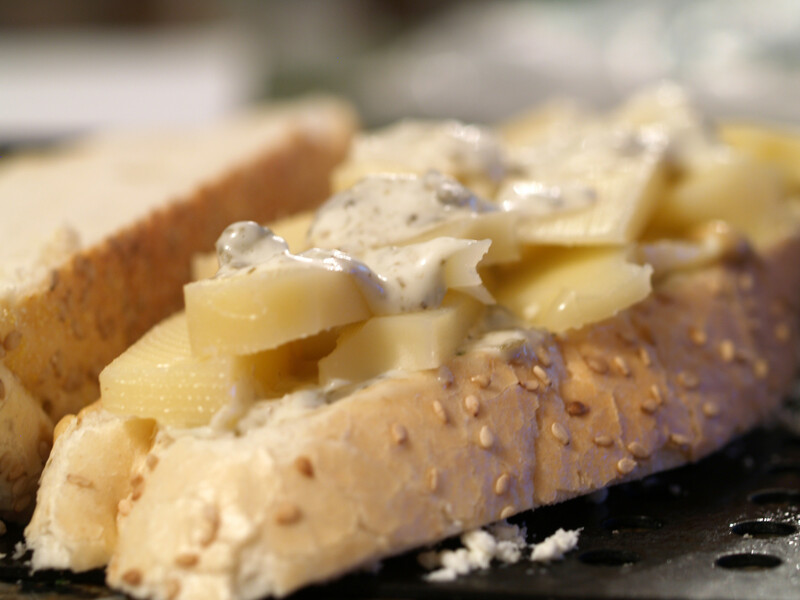 My cheese creation was based on my choice of the Ciabatta rolls, instead of a French Baguette. It just made more sense. (I would have probably gone the Mozzarella route if I went with the baguette.) Plus, these rolls allowed for larger grilled cheese sandwiches. I am never one to turn down more food. Once I decided on the type of bread, I decided that I would purchase two rolls, allowing me to use the cheese concoction for both, while using two different main ingredients. 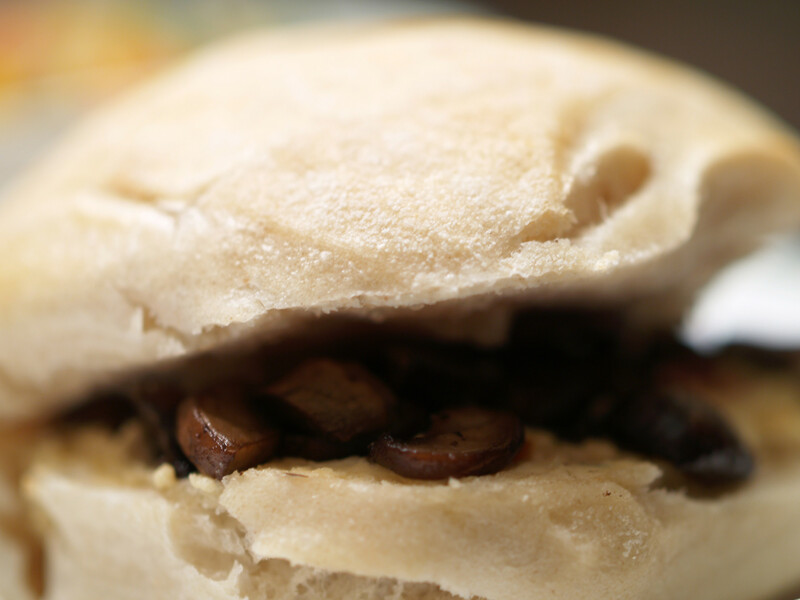 The first ingredient: Crimini Mushrooms. All I did was saute the mushrooms in some olive oil. Simple. I normally add seasoning as I saute, but my mind was in multiple places so I must confess that I forgot. 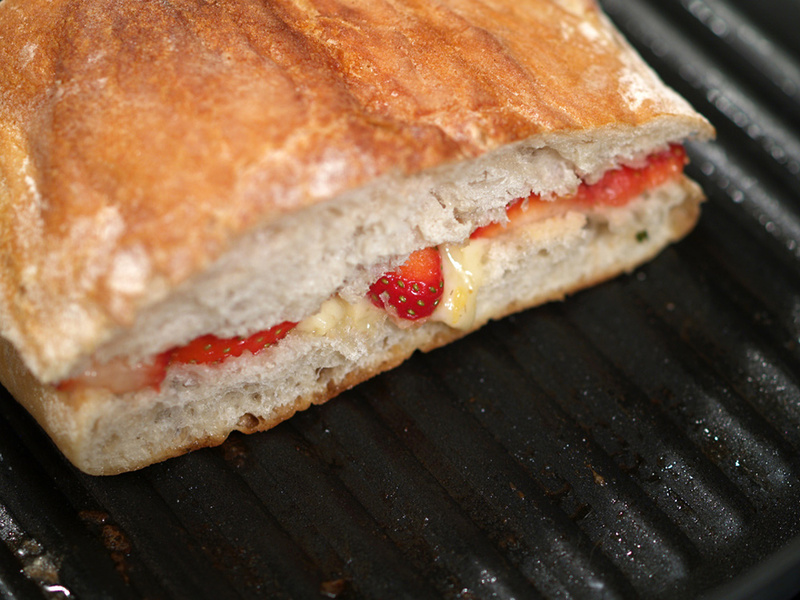 I added them with the cheese in the ciabatta, baked and I was all set. The second ingredient: Scrambled Egg. I won’t say too much about the scrambled egg as I didn’t do anything special and most everyone already knows how to make one. As was the case with the mushrooms, I simply stuffed the scrambled egg between the bread and on top of the cheese and baked. Simple enough. 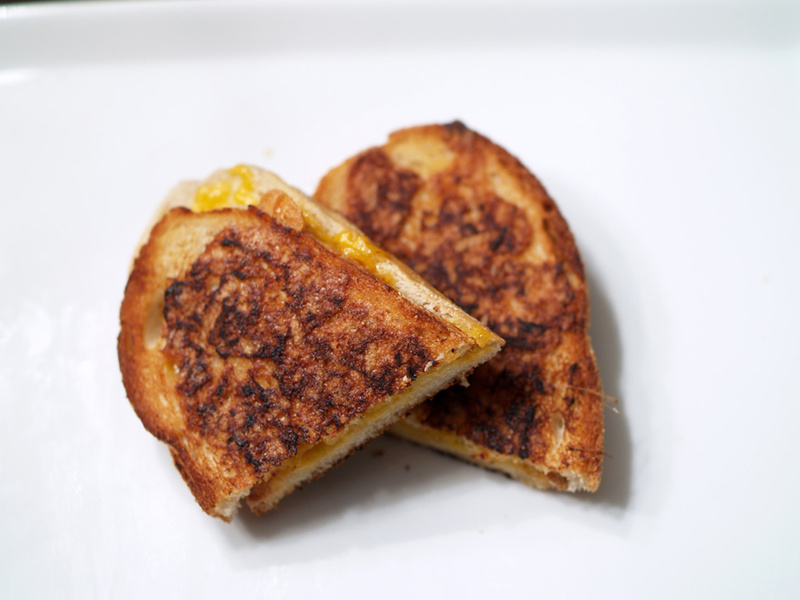 This was a tale of two grilled cheese sandwiches, literally. On one hand there was the Kicked Up Goat Cheese and Mushroom Grilled Cheese Sandwich and on the other the Kicked Up Goat Cheese and Scrambled Egg Grilled Cheese Sandwich. Unfortunately, the mushroom grilled cheese was lacking. I am not sure if it was the roll (not as crispy as the other), or the fact that the mushrooms simply got lost. It didn’t have what the scrambled egg grilled cheese did have. 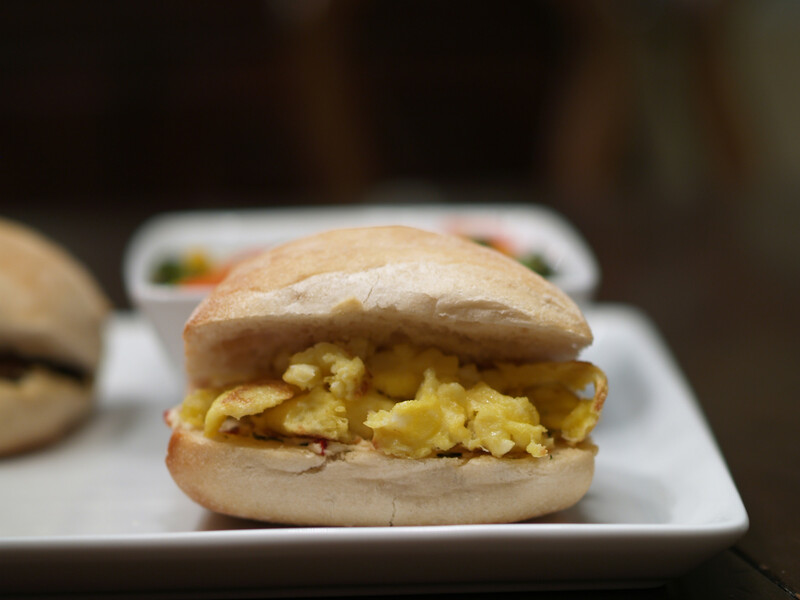 That roll was crunchy, with the interior being the exact opposite, giving the sandwich a great contrast in texture. 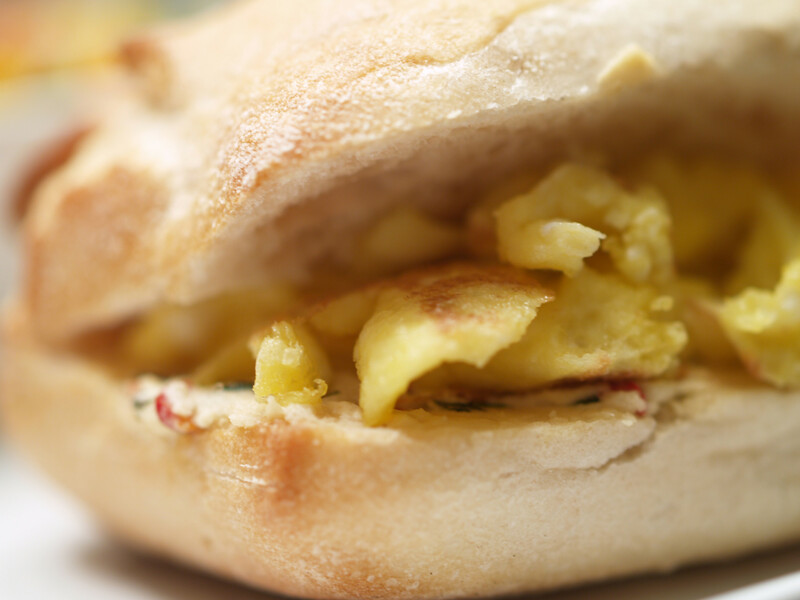 The egg + cheese + roll just seemed to work perfectly together. I made this grilled cheese again this evening and skipped the mushrooms and stuck with just the scrambled egg. It was a wise decision. My only complaint about the Kicked Up Goat Cheese would be that it wasn’t kicked up enough. I am not one that can take extreme heat/spice, but I do like a little kick in my grilled cheese sandwiches. This cheese was more of a mild when I had hoped it would be a medium. Either way, for being homemade on a whim, I think the cheese, and grilled cheeses, turned out great! >> please scroll down to the updated closing section to read my new thoughts, written after eating less-burnt sandwich number two. In order to allow the lemon caper aioli to be the star of the show and stand out front, I chose a milder cheese for tonight’s grilled cheese. 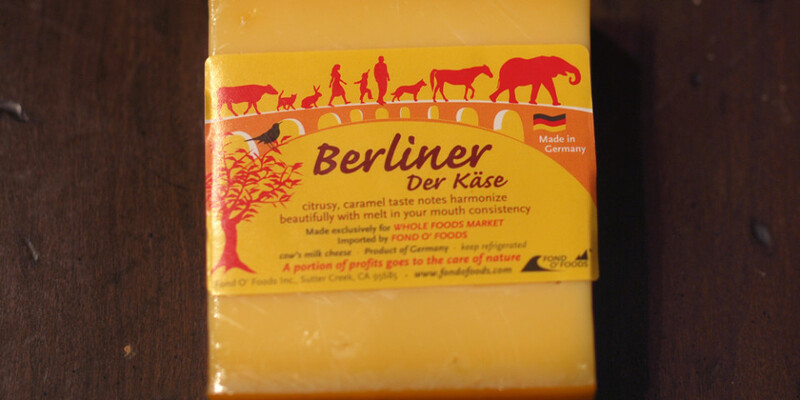 Recognized the world over Swiss-style cheeses are known for their pale yellow color, slightly nutty flavor and large holes in the flesh. But though the Swiss have been making cheese for more than 2,000 years, no one knows for certain how these characteristic “eyes” first came about…learn more. 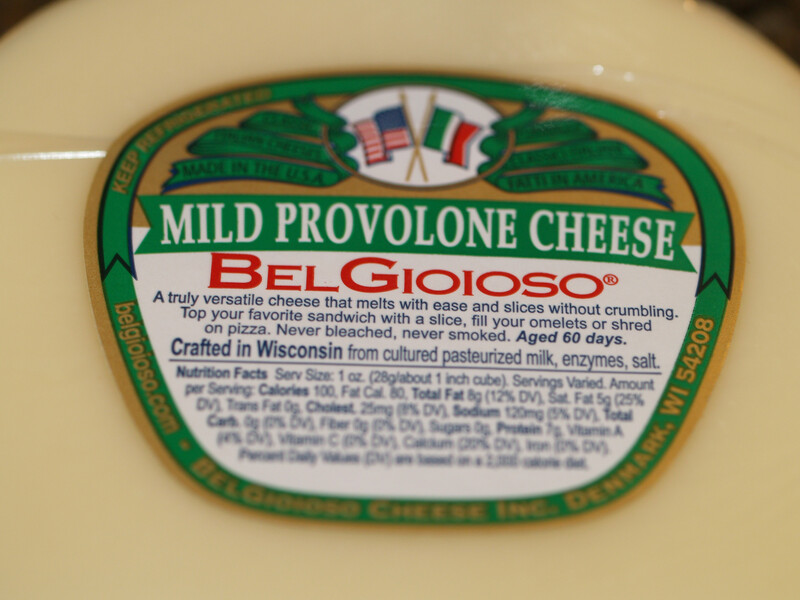 Unlike the Asiago from last week which was in your face, the Swiss tonight was much more mild and in the background. It took a second after chewing before I could truly taste the typical Swiss flavor. 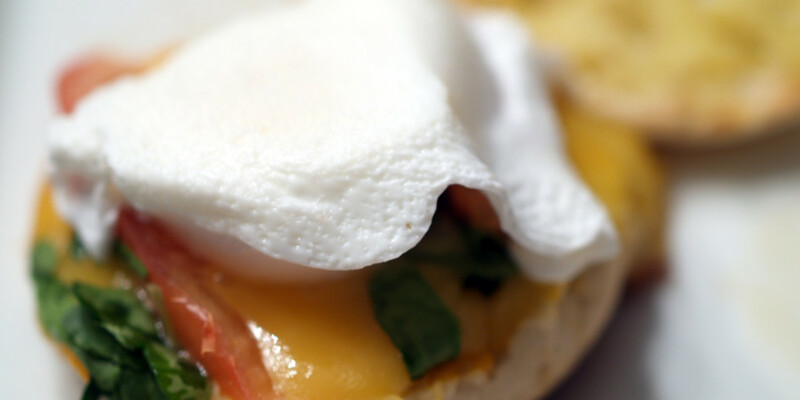 It was light and definitely had more of a texture as compared to a mozzarella but not as much as an Asiago. 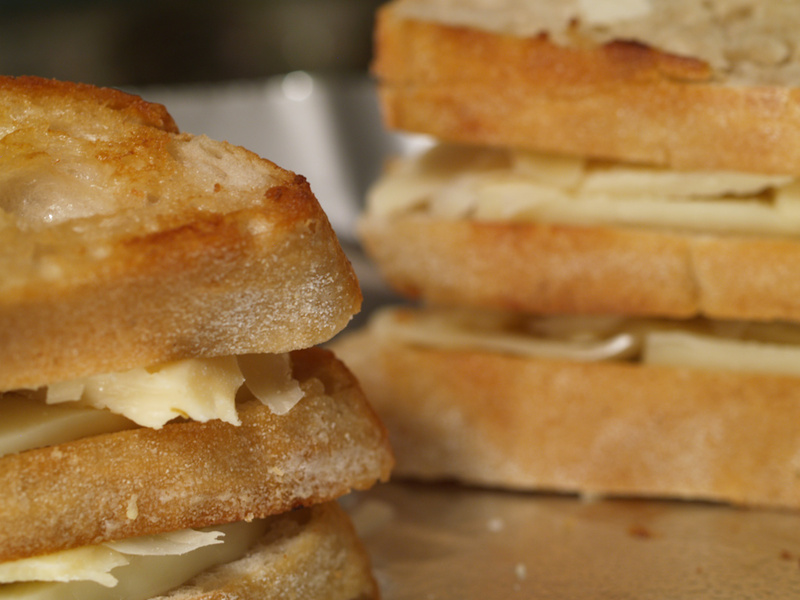 It was good and perfect for tonight’s grilled cheese, where the cheese was actually not the focus. Here I sit a few hours after I took the final bite and I am still not sure what to say about it. Did I like it? Yes. Did I not like it? Eh, I wouldn’t go that far, but there were times where I thought it was good by not great. I tried something different by going with a lemon caper aioli instead of fruit/vegetable ingredients, which can become boring. The lemon caper aioli consisted of mayonnaise, a bit of olive oil and garlic, capers, lemon zest/juice, white onion, and salt/pepper all mixed together in a blender. 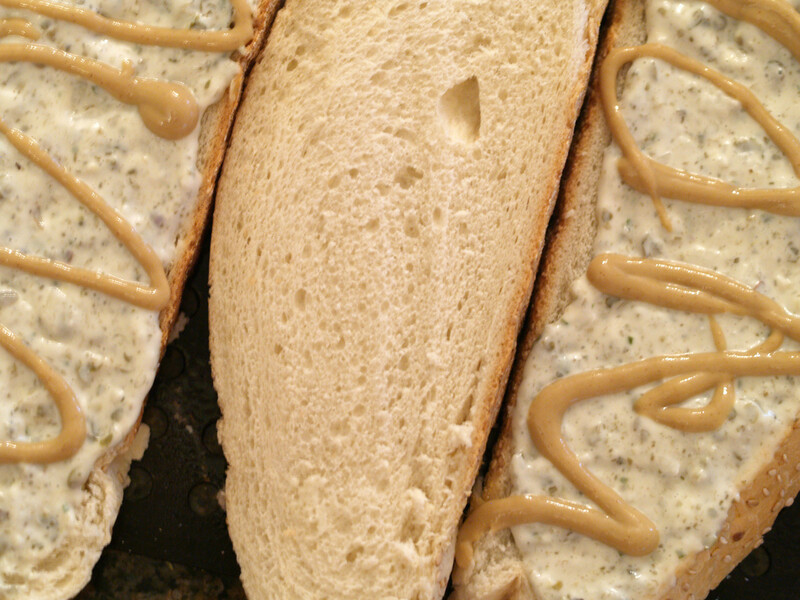 Unfortunately, we forgot to include the mustard, so we simply added it after spreading the aioli on the bread. 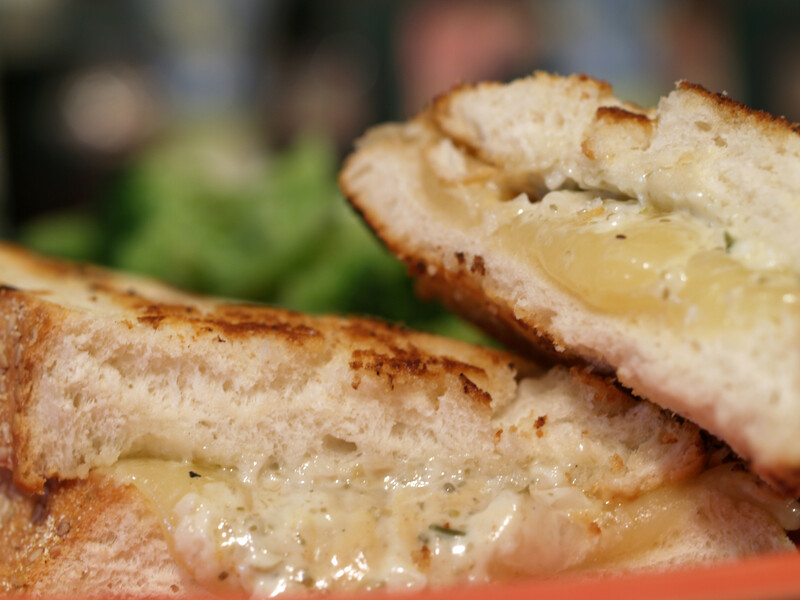 Prior to creating the actual grilled cheese, I of course tasted the mixture and It had a great overall flavor with the lemon and capers shooting to the forefront. It would be great on just about anything (chicken, fish, homemade potato chips, etc.) but maybe not a grilled cheese. I still haven’t decided. 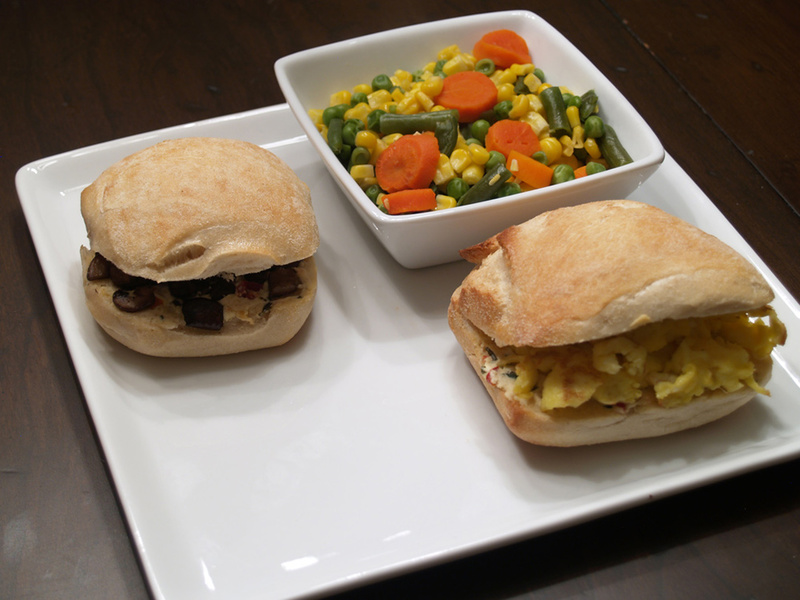 Tonight, since the weather was perfect outside, I decided to grill the sandwiches, which I had yet to do. Let’s just say that I will need a lot of practice before perfecting truly grilling a grilled cheese. Thankfully the sous chef was able to scrape off burnt portions of bread. Plus, we were very lucky to have enough bread to be able to throw away one slice. I had forgotten that the melting/dripping cheese would make the flame larger and stronger, which almost did in my grilled cheeses. Either way, I am still not sure about this sandwich. The bread, a normal Italian, worked out perfectly. It is a great bread by itself, with butter, or as a sandwich bread. 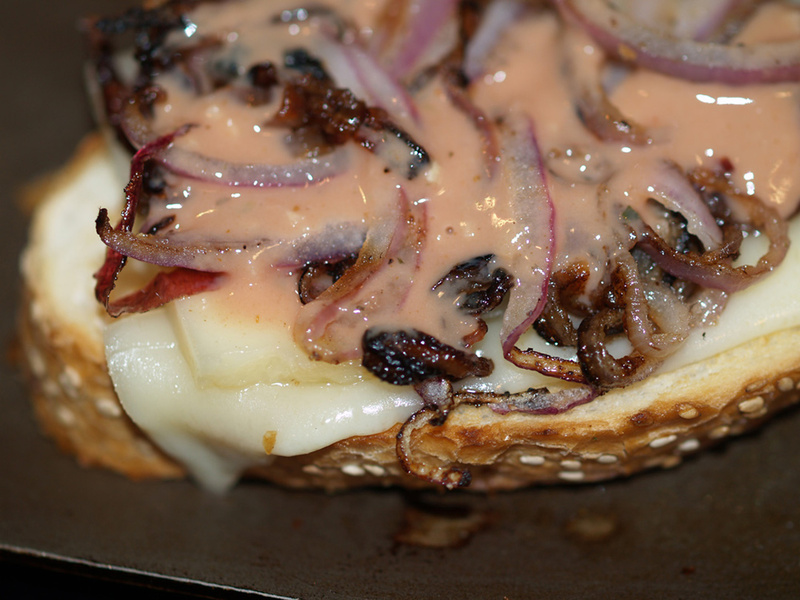 The Swiss cheese melted perfectly on the grill, which made me very happy. However, that aioli, I don’t know about that. The night has continued on as I try and grapple with what I thought of this grilled cheese. Unfortunately, I still do not know. It was both great and somewhat good. The idea was great in my opinion it may not have been perfectly executed. 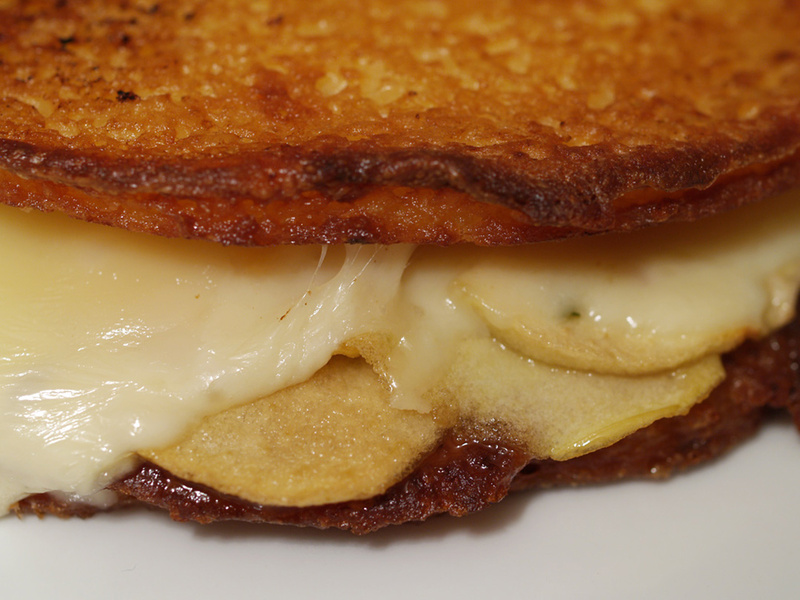 Also, we started creating this grilled cheese late so there was somewhat of a rush. That is never good while trying to create a masterpiece. 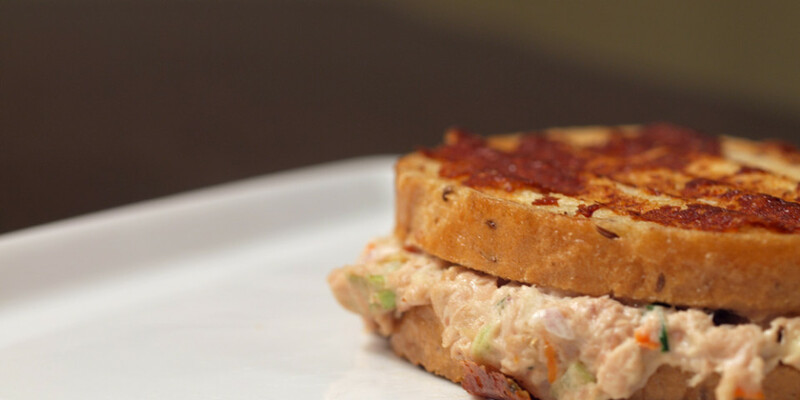 Tomorrow night will be take two of this sandwich. I still have aioli, swiss and bread left and plan on recreating this sandwich hoping that I may have an answer 24 hours later. Cross your fingers. 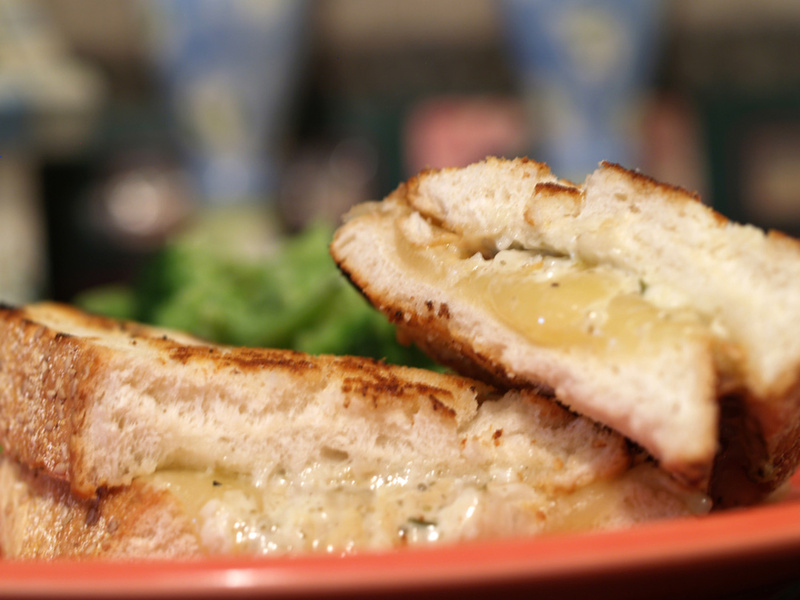 Tonight, I recreated the lemon caper aioli grilled cheese, all down to cooking it on the grill. Luckily, I kept a watchful eye and did not burn the sandwich, but instead cooked it thoroughly. 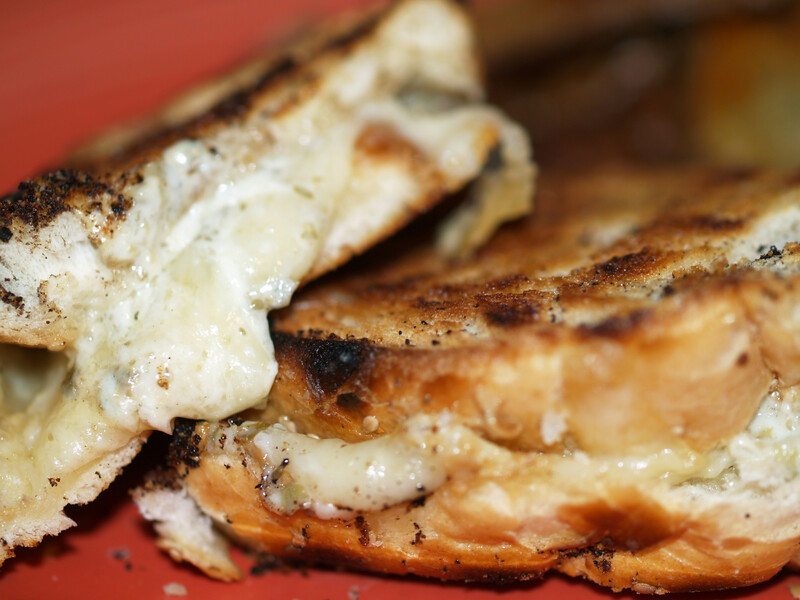 This grilled cheese allowed for nicer looking photos and an improved tasting of the sandwich. I also was able to figure out the conundrum that plagued me all last night into today. When cooking inside, on a pan, we are able to butter and butter the bread making it soft and moist. 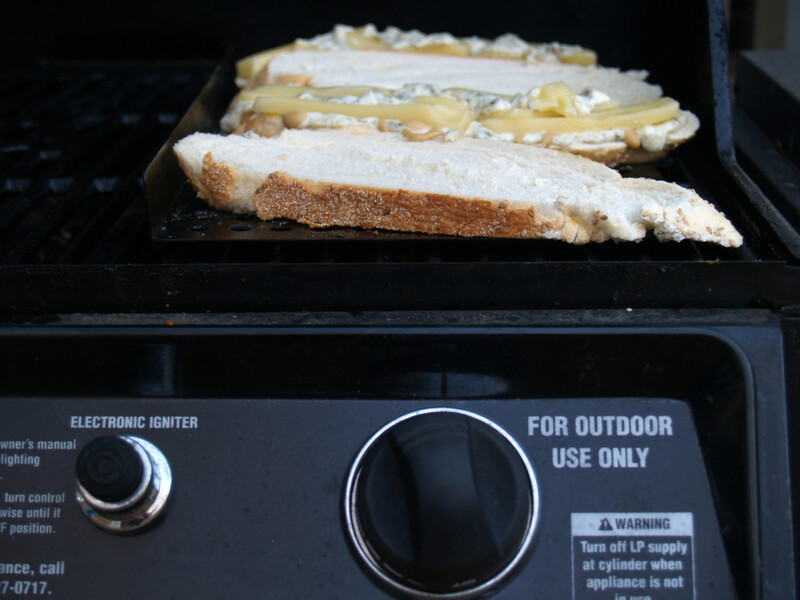 However, when cooking on the grill, I am not able to do that, even though I did butter the bread. 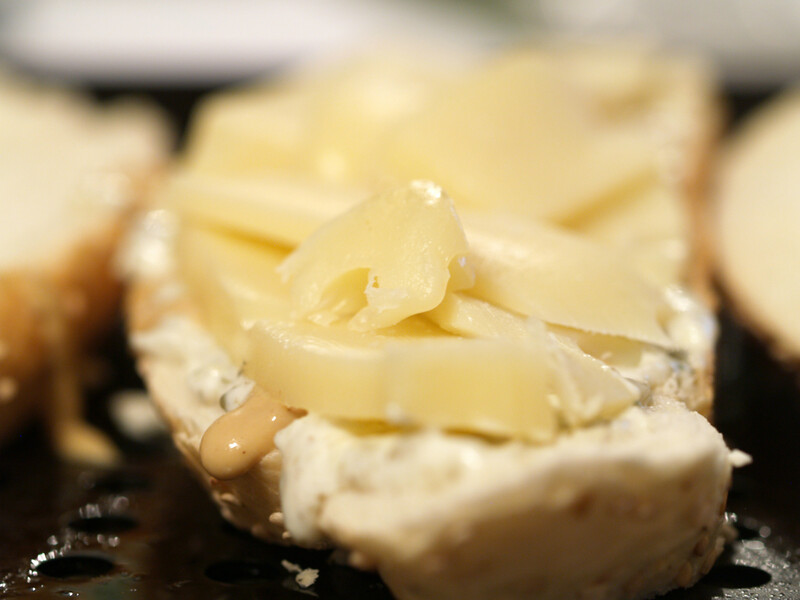 Therefore, the bread was dry and crunchy while the insides, the cheese and lemon caper aioli, were wet. The conundrum was simply a texture issue: dry vs. wet. It really is as easy as that. Weird, huh? 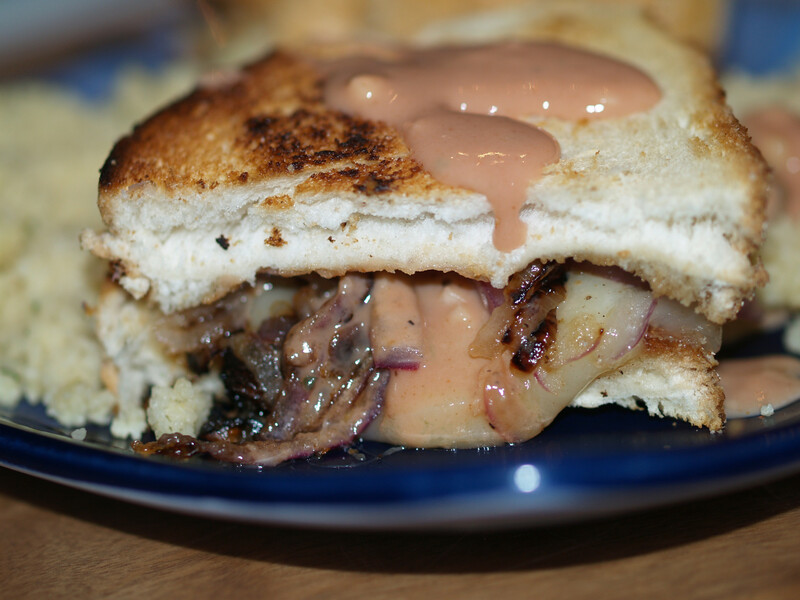 Beyond the texture issue though, this was a good grilled cheese and something that I would make again, for a third time. I just need to get over the texture issue. Now that I have tasted the grilled cheese for a second time, I am changing the grade, for the better. But back to the present. I ended up on BBQ sauce. However, as my sous chef noted, straight BBQ sauce might be a little strange and a little too strong. Therefore, we decided to add ranch dressing, in addition to some garlic and jalapeno to the mix. It ended up turning out fantastic, even if there might have been too much of a kick. I would rather have it too spicy, as in the past, my sauces/condiments have been too tame for my tastes. One of my recent problems was that I tried to do too much with a simple sandwich. 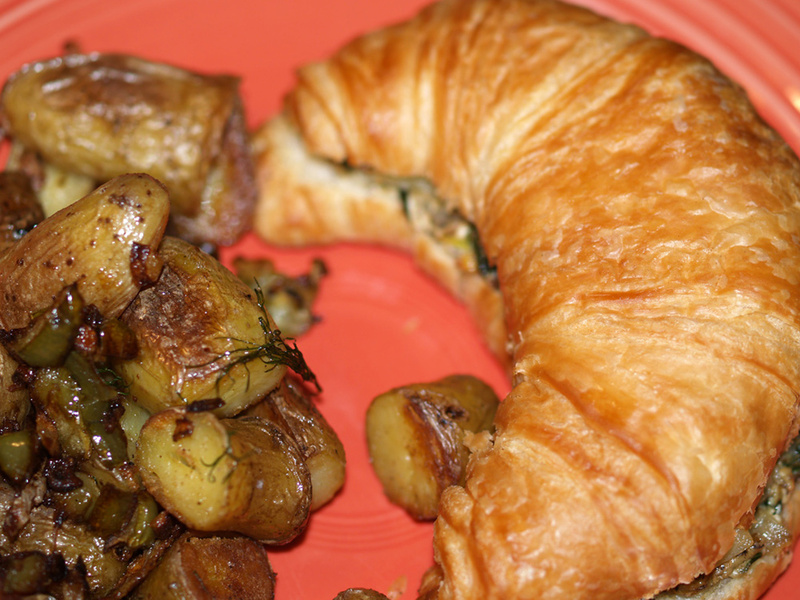 I tried to be too fancy and/or include too many ingredients. 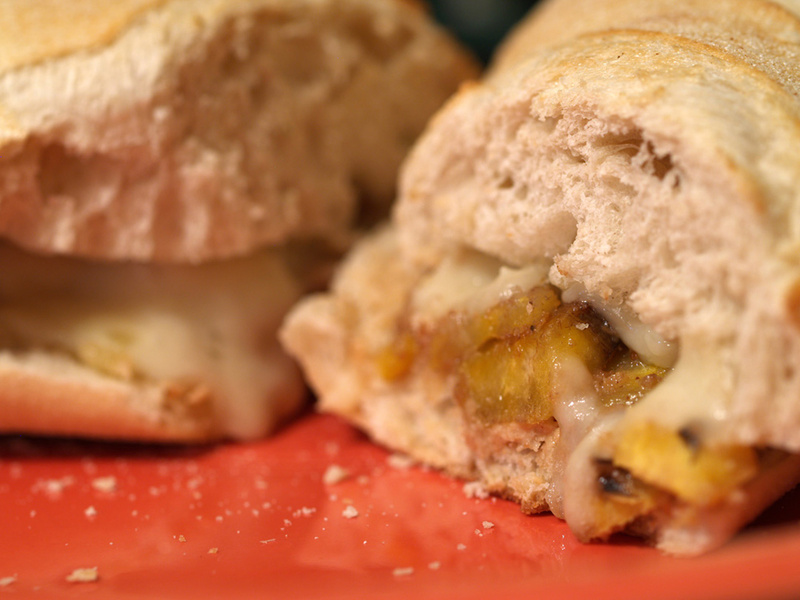 This week, I avoided that pitfall and that helped make the sandwich as good as it was. 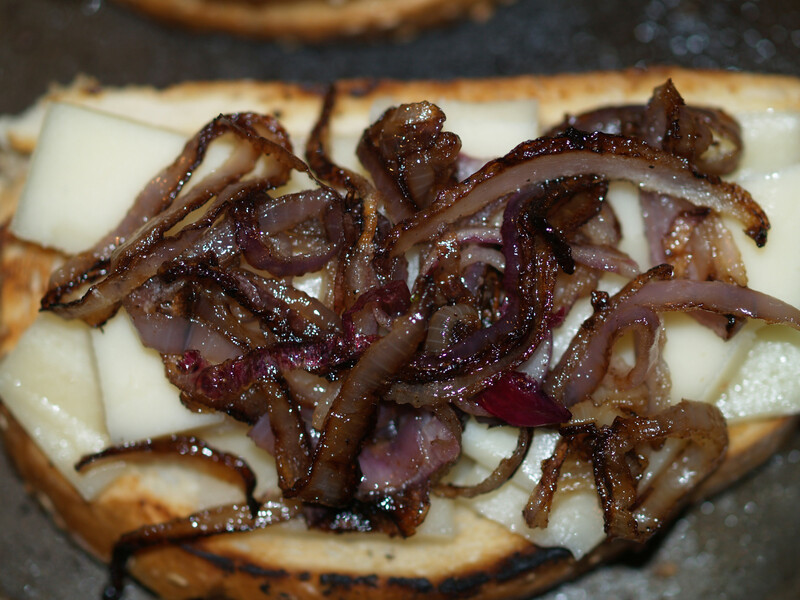 In addition to the mild provolone cheese, all that was added was grilled red onions. 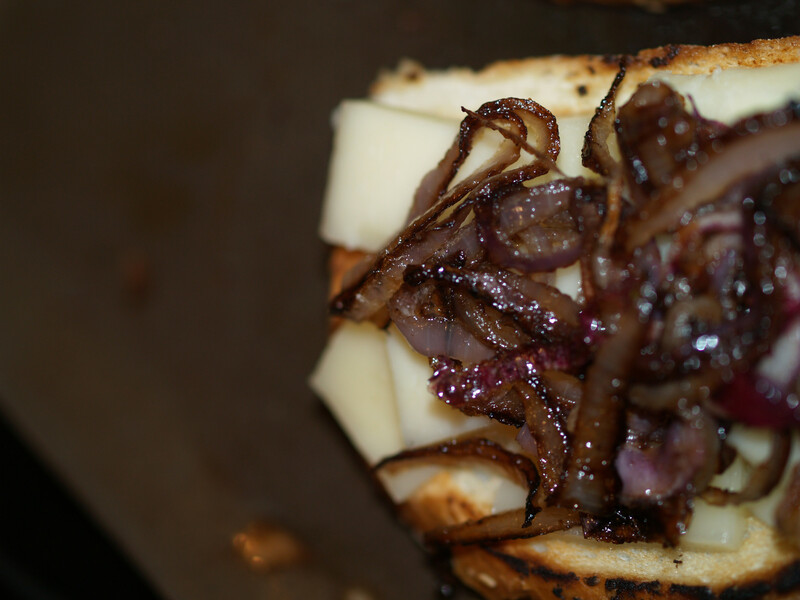 We grilled the onions with only olive oil, salt and pepper and called it a day. That is it. 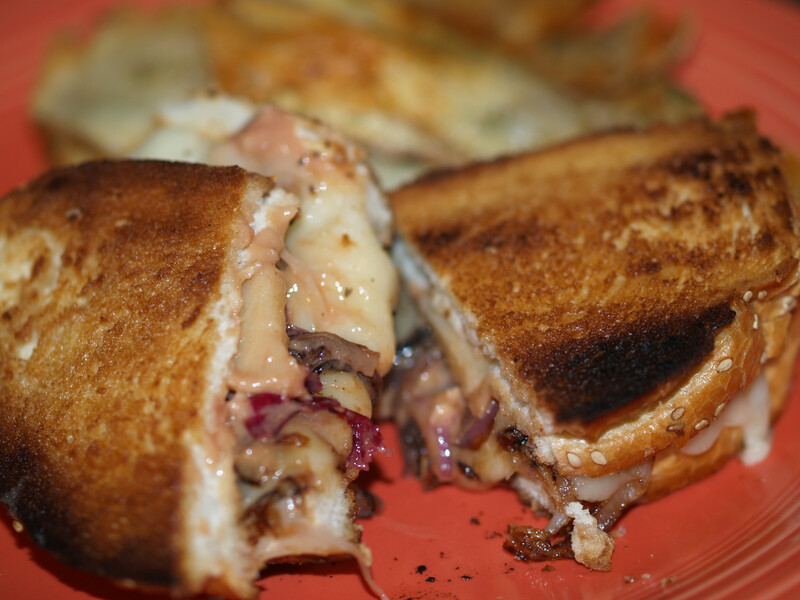 It may sound too simple, or even boring, but the BBQ sauce really added a lot to the grilled cheese. 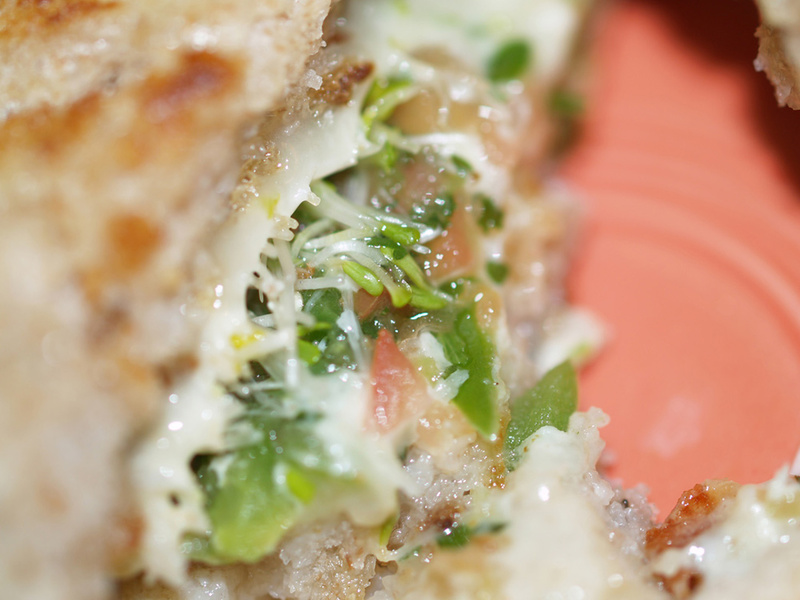 Plus, the Italian bread, whether it be by itself or as a part of a sandwich, is amazing. I took a chance, and with the assistance of my sous chef, I succeeded. BBQ sauce by itself might not have worked but BBQ Ranch definitely did. Maybe it was a bit too spicy, but in my opinion, that is much better than too bland, which has happened on multiple occasions. Overall, I would say this was a winning grilled cheese.